About a week ago, the Galaxy Buds passed through the FCC (and were leaked by Samsung Turkey). However, this is our first real look at the Buds, which look like, well, every other pair of true wireless earbuds. Samsung also seems to have taken a page out of Huawei's playbook, allowing the Buds to wirelessly charge from the back of your S10. This isn't something that anyone is going to use in the real world — nobody's going to stop using their phone for 30 minutes to get some charge in their earbuds — but it makes for a nice marketing and sales gimmick. WinFuture expects these to come in at 149 euros. Speaking of the S10, Samsung is reportedly set to announce a high-end version with ceramic backs, offered in black and white. 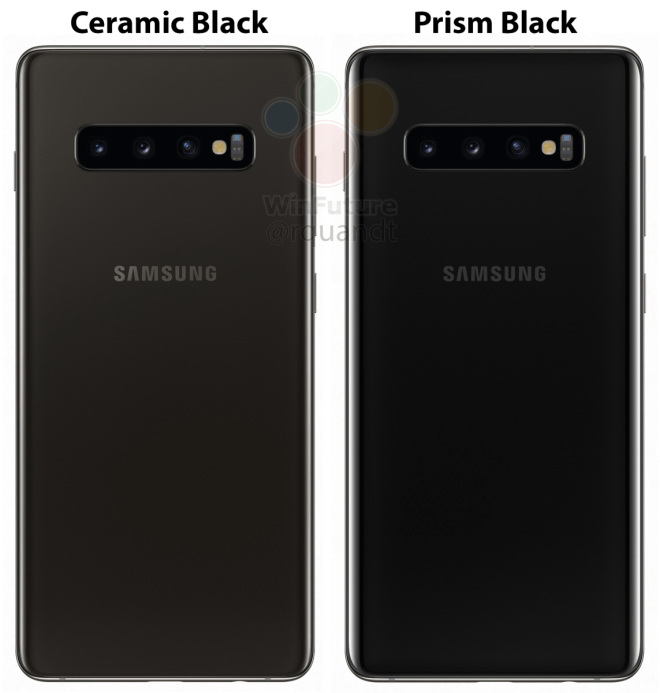 Pictured above is the Ceramic Black S10+ next to a regular Prism Black S10+. The Ceramic Black appears less glossy, but the real difference will be from the feel and heft. You can check out a ton more Galaxy S10/S10+ photos at the WinFuture link below.